As Moncton’s Hubcap Comedy Festival prepares to kick off its 17th edition tonight, festival manager Robert Gallant is looking forward to helping Metro residents break out of their winter doldrums once again. Gallant shares that while the weather outside was occasionally frightful during last year’s festival, hearty and laugh-seeking Monctonians continued coming out in droves to the shows. Looking at the talent set to take the stage at this year’s edition of the Hubcap Comedy Festival, organizers may see a new attendance record set. A combined roster of 25 Anglophone and Francophone comedians are set to descend upon the city, including Moncton native Julien Dionne, Nikki Payne, Martin Saulnier, Derek Seguin, Toronto’s Ali Hassan, Maxim Martin and New Brunswick native Candy Palmater. Gallant acknowledges that while some of the performers may carry more in the way of name recognition than others, the festival is in the fortunate position of having built up a loyal audience that knows they will be treated to some of the best comedians north of the 49th parallel. 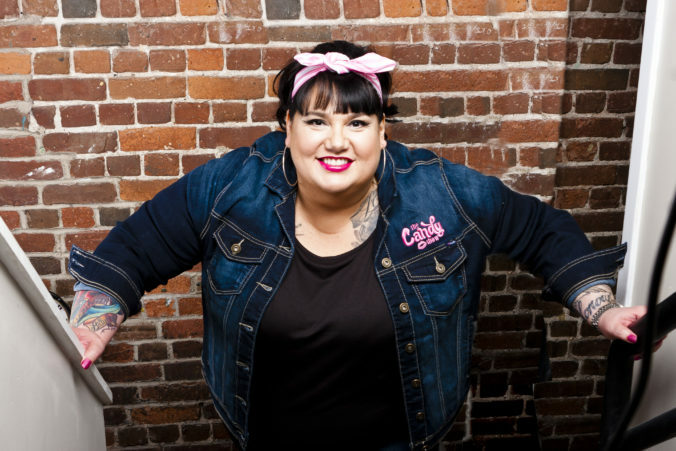 For CBC Radio host and comedienne Candy Palmater, having the opportunity to come to Moncton to play host for a show at the Capitol Theatre is very much like coming home. Palmater grew up in Point La Nim, nestled on one of New Brunswick’s most northern tips, located between Campbellton and Dalhousie. As a teen, inspired by posters of Motley Crue that adorned her bedroom walls, Palmater confides that she dreamt of being a rockstar. While a career performing music might not have been in the cards for Palmater, interviewing musicians was something she felt confident she could do. “I was sitting in my pink bedroom at home, reading Rolling Stone, and would get frustrated if interviewers were asking bad questions. I used to daydream about Motley Crue performing and then having the opportunity to talk with them after,” she says. Palmater’s first foray into television arrived via APTN, the Aboriginal Peoples Television Network. The Candy Show became a highly successful variety television series that ran for five seasons, securing numerous award nominations and wins along the way. Palmater’s multi-faceted array of talents soon landed her a job on air with CBC as host of The Candy Palmater Show last summer before moving on to serve as a temporary host of the network’s popular program Q. Despite having successfully branched out into other mediums at various points in her career – she has starred in HBO’s Call Me Fitz and also appeared in Season 10 of Trailer Park Boys -comedy has remained a constant throughout Palmater’s life. “I was super shy as a child. When I had to go to school, I cried like a baby because I didn’t want to leave my mother and father,” she recalls.